As you may have noticed already, early-days pre-Neo Geo SNK is a real treasure trove of classic shoot ’em ups. And few come more classic than Vanguard. First released in 1981, Vanguard was another game of “firsts” for the fledgling SNK. It was not, as some sources claim, SNK’s first colour game — Sasuke vs. 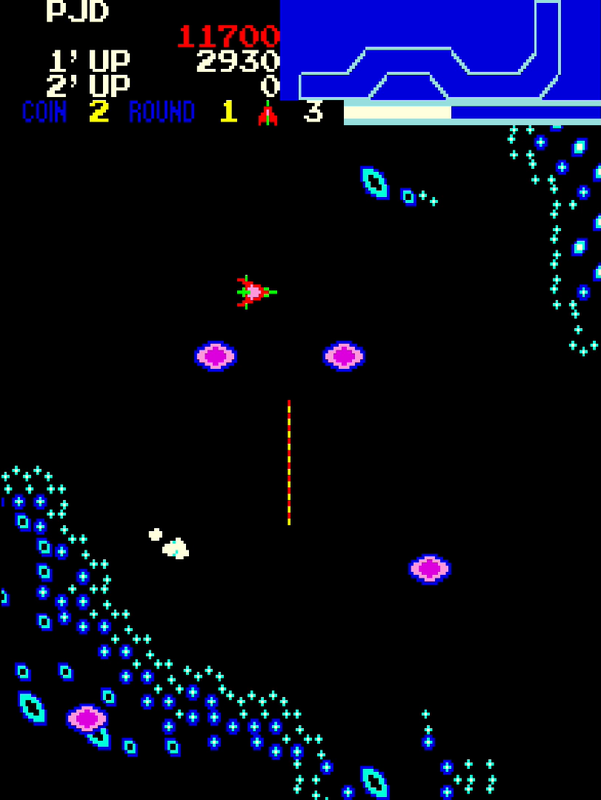 Commander predates it by a year — but it was their first to incorporate something that would become a mainstay of their later titles, including Bermuda Triangle and World Wars: multi-directional shooting, independent of movement direction. It also featured some delightful synthesised speech and gratuitously, shamelessly stolen music. And it’s a lot of fun to boot. Let’s take a closer look. Before we jump into the game itself, it’s worth noting that this was developed by Tose, not SNK, and was one of the earliest recorded examples of the former acting as a “ghost developer”, completely leaving their name off a product they had worked on in favour of their client or publisher. Tose, if you’re unfamiliar, have developed somewhere in the region of a thousand different games for various platforms since 1979, with many of them published by Nintendo. They are still going strong today, with their most recent work including contributions to Square Enix’s World of Final Fantasy and Capcom’s Resident Evil Revelations series. Indeed, Tose’s name is nowhere to be seen on Vanguard, but it is an early example of their work nonetheless, and from a historical perspective that should be acknowledged. Anyway, to Vanguard itself, which we’ve actually seen once before already here on MoeGamer as part of the Atari A to Z series. Vanguard is a scrolling shoot ’em up in which you take command of a spaceship that can move in eight directions and fire in four. On the original arcade machine, Vanguard used four buttons to fire in the different directions rather than a Robotron-style twin-stick setup, but modern ports such as that found in the SNK 40th Anniversary Collection tend to take advantage of dual-stick setups for convenience. Vanguard’s unique selling point, besides its multi-directional shooting, is the fact that you progress through a number of different “zones” on your journey to defeat the evil Gond, and each of these has its own distinctive aesthetic, layout and scrolling direction. Yes, Vanguard doesn’t just scroll horizontally; it also scrolls vertically and diagonally, and quickly adjusting to the various demands this makes of you is a key part of learning to succeed at the game. 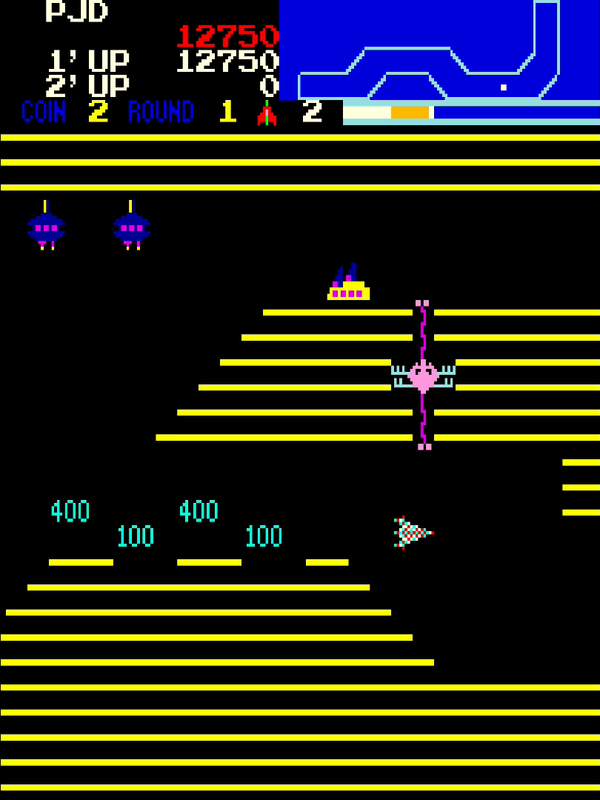 Your game begins, accompanied by a rough approximation of Jerry Goldsmith’s theme for Star Trek: The Motion Picture, in the Mountain Zone, which is a horizontally scrolling cavern similar to that seen in Konami’s Scramble, which came out earlier in 1981. Here, you are beset by enemies that appear from the right of the screen and either fly right at you or weave to avoid your shots. You only encounter one type of enemy at a time, though several of them may appear at once, so quickly determining whether to fight or avoid them is of critical importance. This is then followed by the diagonally scrolling “Rainbow Zone”, in which jellyfish-esque enemies appear from above and below you and attempt to ram you. The Rainbow Zone is also accompanied by one of several musical themes that appear in the game — beginning a tradition that was later continued in titles such as Bermuda Triangle and World Wars, the somewhat ragtime-esque track that accompanies any trip to the Rainbow Zone feels completely incongruous with the on-screen action and is all the more charming for it. Next comes a return to horizontal scrolling in the Styx Zone, which is a narrower variant on the Mountain Zone with a somewhat “spikier” look and feel thanks to numerous sticks poking out of the scenery. The enemies from the Mountain Zone return to harass you — again, only one type appears at a time, but they often have strength in numbers, requiring you to either nimbly dodge them or clear a path with your shots. After a second Rainbow Zone, scrolling diagonally down this time, we come to the horizontally scrolling Stripe Zone, another cavernous area in which flying enemies are replaced by static ground installations. The route splits in the Stripe Zone on regular intervals, and thus attaining high scores is dependent on learning which direction has the most targets — and being ready to destroy the laser gate generators that just want to ruin your pleasure flight. Due to the relatively low risk factor and the very high value of the targets, Stripe Zones tend to be where you’ll rack up the high scores. One last Rainbow Zone leads to the vertically scrolling Bleak Zone, which concludes with the Last Zone, where the Gond resides, just waiting for you to fire a lucky shot through his moving barriers and take him out. After you’re done with this, the game returns to the start of a new sequence of zones — they’re the same types of zones, but this time around they’re arranged differently. While playing Vanguard, there are a few mechanics to pay attention to. First is your fuel level, which gradually declines over time, but which is replenished by shooting enemies. 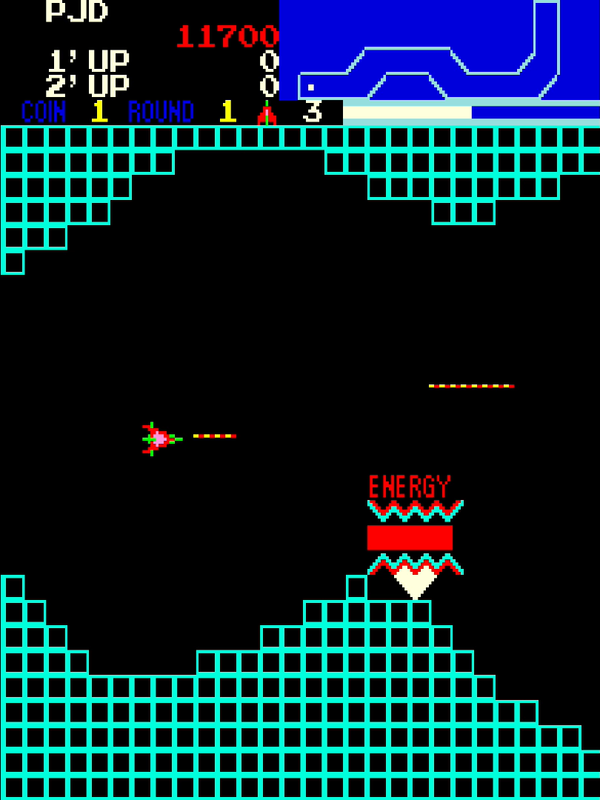 Second is the presence of “Energy” bases that appear throughout the horizontally scrolling stages. 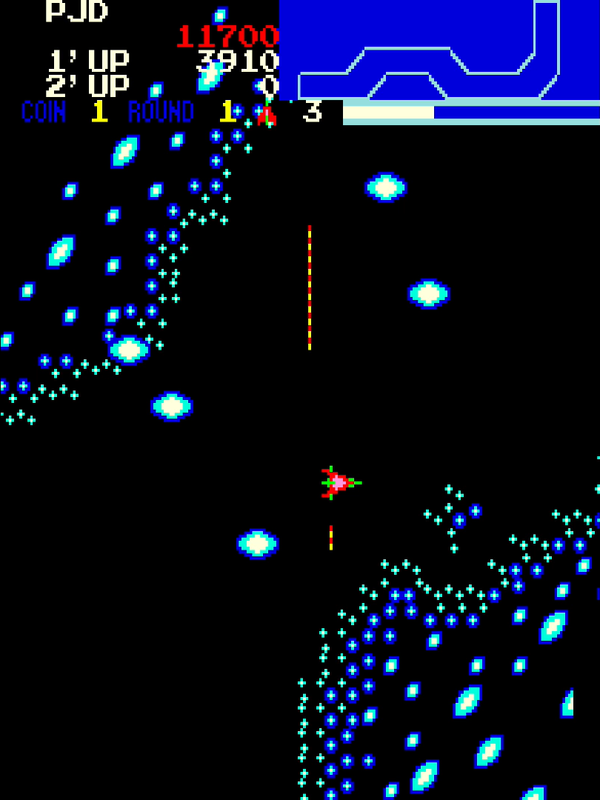 Flying through one of these causes you to become invincible but unable to shoot while a rough approximation of “Attack of the Hawk Men” from Flash Gordon burbles out of the game’s custom audio chip. Just prior to invincibility expiring, the speech synthesiser will urge you to “BE CAREFUL”, providing you with ample opportunity to get yourself back into a good position for dodging and firing rather than ramming. The synthesised speech was actually something of a selling point for Vanguard at the time, and considering this is a game that came out in 1981, it’s actually rather impressive in terms of quite how much there is, and how little it interferes with the game’s performance. Each new zone is announced verbally rather than through on-screen indicators, you’re wished “BON VOYAGE” at the start of the game and charging up with energy encourages you with those immortal (and distinctly Japanese-feeling) words “LET’S ATTACK”. There’s one last “first” that Vanguard gave us, and it was so unusual at the time that Tose and SNK felt the need to give players a detailed explanation before they were able to take advantage of. I’m talking about a continue system, or as Vanguard rather verbosely puts it, “PLAYERS CAN BE ALLOWED TO START THE GAME FROM THE SAME ZONE WHICH IS AT THE POSITION OF GAME OVER IF PLAYER PLAY AGAIN WITHIN 30 SEC. BUT FOR FIRST PATTERN ONLY.” I think you’ll agree that “Continue?” is a rather snappier way to get across the same message. As the lengthy message indicates, Vanguard’s continue system only lets you credit-feed your way through the first loop of the game, however; once you’re onto the second round and beyond, that one stock of lives is all you have, so you better make the most of them. 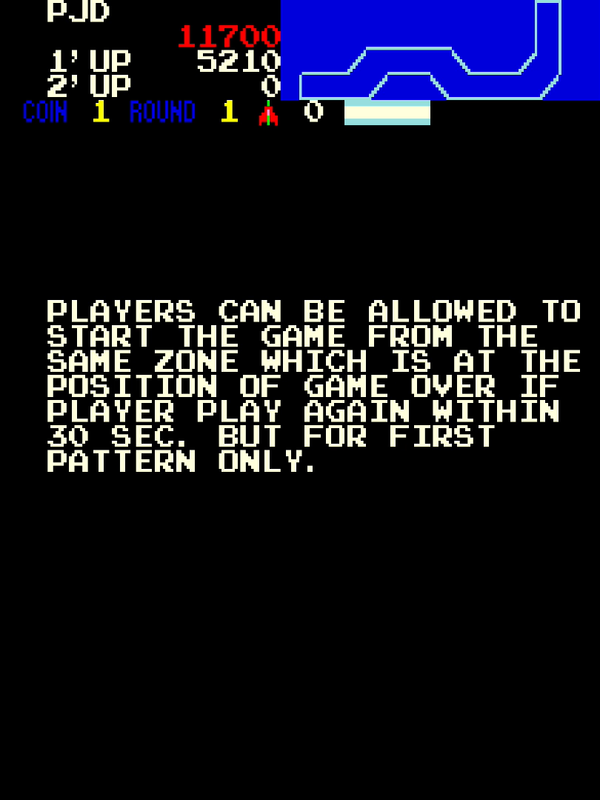 This implementation was presumably to allow players the opportunity to see “the whole game” (or at least all its constituent parts) while allowing arcade operators a healthy turnover of players trying their luck at the machine. 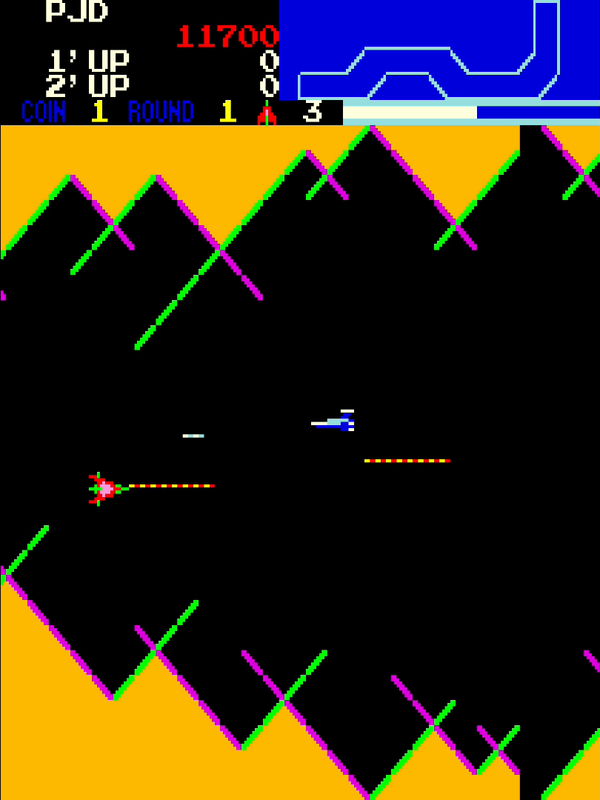 This continue system actually made it into the popular Atari 2600 and 5200 ports of Vanguard, making these versions surprisingly true to the arcade original — albeit without the speech synthesis. Is Vanguard still worth playing today? Absofrigginglutely. Of all SNK’s early titles from the 6502 “Rockola” era, this is one of the strongest, and it still holds up brilliantly today, combining accessible mechanics with a challenge just stiff enough to keep things interesting, but which never feels like it becomes overwhelming or unfair. It also feels like an early acknowledgement of what modern shoot ’em ups are really about — less about shooting, more about positioning yourself to keep yourself out of danger while taking as many enemies down with you as practical. It’s become a personal favourite of mine just recently — to my shame, I was unaware of its existence prior to seeing Classic Game Room’s video on the 2600 version a while back — and for anyone interested in shoot ’em up history, it’s an essential title to add to the “to-play” list if you’re not already familiar. I love Vanguard. Of course I never saw the arcade cab as a kid back in the day. But I played the hell out of the 2600 port which is quite good! Yep. Both the 2600 and 5200 versions are extremely competent! I played the Atari 8-bit version a while back, too, that’s the one I made the video on. I’m not sure if that is “official” or not — I think it was a fan port of the 5200 version.